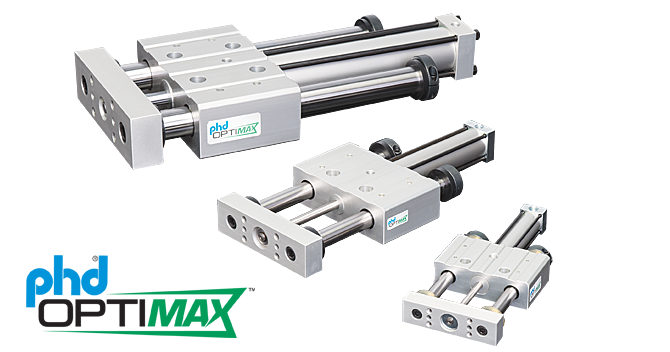 Pneumatic Slide | Versatile Thruster | Optimax | OSD | PHD, Inc.
PHD Optimax® Series OSD Pneumatic Thruster Slides are robust linear actuators designed for precision and are ideal for a variety of applications. They are the lower price alternative to the Series SD Pneumatic Thruster Slides, which have more options and longer cycle life. The Series OSD is available in three bore sizes and offers standard travel lengths ranging from 1 in to 10 in. To simplify installation and provide for interchangeability, the OSD features a tool plate for mounting of tooling or other actuators.